As the title of this book seems to suggest, I expected this book to be more about deep sea hydrothermal vents and other such goodies. Imagine my surprise when the author spent a most of her time talking about how she started studying this topic, how she became a submersible pilot, what it's like to be a submersible pilot, etc. I recognize that she was probably very proud of her achievements - at the time, she was one of the only female submersible pilots in the world (I have no idea if this is the case anymore; this book is 15 years old). And she should be proud, but the title of this book isn't The Octopus's Garden: How I Became an Alvin Pilot.What I'm saying is: I needed more science and less biography.The only thing that moved me to give this book 3 stars rather than 2 is that what little deep sea science she does share is so damn good. For example, who knew that there are tubeworms that grow on deep sea vents that survive not on food, but on bacteria within their own bodies, which in turn survive on the sulphur spewed from the vents? Fascinating!If the book had been chock full of those kinds of tidbits, it would have been a lot better. Bottom line: not very biology-y. Don't let the title mislead you: no octopi to be found. What it is is a discussion of deep sea vents and the tube worms, shrimp, and crabs they host. What it did have a lot of was geology and oceanography. I would say that at least half of the book was spent explaining these disciplines, and not biology, which is what drew me to the book. While I think some explanation of these topics IS necessary, there does not need to be so much. I also did not find the story telling to be engaging-- it jumped from topic to topic more along a timeline narrative than one conducive to sequential explanation of information. Perhaps this is just a result of the fact that so little is known. This book was and inspiring and fun to read. The fact that the author is a woman and the first woman to dive/pilot the Alvin reminded me that there is nothing that I cannot do if I put my mind to it. I was impressed by her writing style - informative yet never dull. Some times I was even completely drawn in to her world; excited when she was excited, cheering her on. It gave me a new perspective on marine scientists, what they do, and ho they feel. I appreciate the end nod to rising environmental consciousness and accountability. The book was more about Van Dover's thrill of her success than about the bottom of the ocean. She was the first woman pilot of the Alvin, allowing her to travel to the depths of the ocean. I would like to have known how the Alvin collects its samples and steers through the unstable rugged terrain of the deep sea. 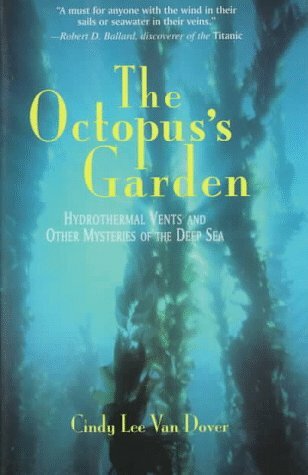 She provided drawings of deep water flora and fauna that were helpful but at least one color photo showing the Octopus's Garden would have enhanced the reading experience. The most interesting part of the writing was the author's discussion of the vents and the black smokers. ?I'm not sure this was the edition I read, and it looks like I'm going to have to reread it, because this isn't how I remember it. The book I read was by the first woman to captain the Alvin, who commented that more people have been on the surface of the moon than have captained the Alvin (meaning fewer than 12 have captained the Alvin).If this IS the one I read, I've mingled what I got from it with stuff from other sources: so I'd say a reread is definitely in order. An overall great read for anyone looking for an introduction to hydrothermal vents and benthic ecology.